← US Olympic Committee, who’s the class act now? On our first trip to the new Cabela’s in our area, I pointed this out to my hubby, who is an avid bass fisherman. A few weeks later, he called me at work to ask if I would use one. I was pretty gobsmacked – I didn’t think he was really listening to me, much less that he would remember! Anyway, he said he would use a line counter occasionally, but probably not enough to justify buying it. But if I would use it, too, then he’d pick one up. Not that it was expensive, but we already have enough clutter! 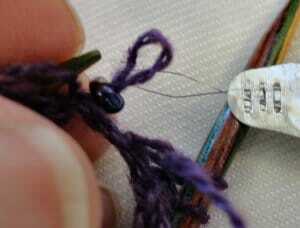 Obviously, this is useful only for finer yarns, but that works for me. 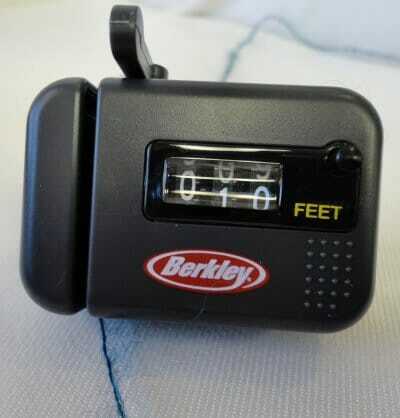 Its first job was to count the remaining yardage after I finished a shawlette… I just set up my ball winder and ran the yarn through the counter its way to being wound. I did find that it needed a little calibration. The arrow is pointing to the tension mechanism that flips down; there’s a knurled knob tension adjuster around the corner. That’s a good thing, because silk and mohair is kind of slippery! 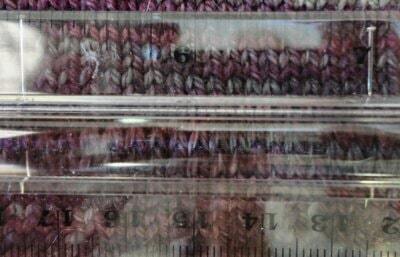 Next up, measuring the cashmere blend yarn left on a cone that I got in a traveling swap box! The Container Store is another great source – and maybe some day I’ll be able to browse one of their brick-and-mortar locations. In the meantime, we went online and made a shopping list when our younger daughter offered to pick up some things for us while she was in Denver. 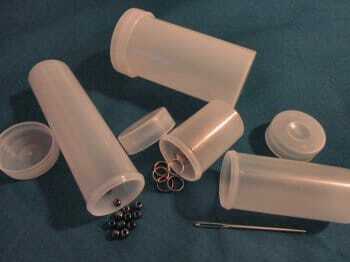 I got several small lidded containers, perfectly sized for stitch markers, needles, and beads. 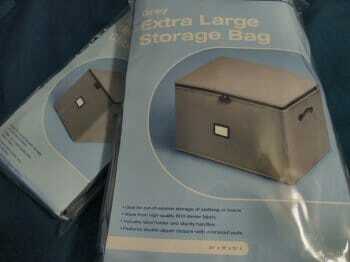 Also on my list – zippered fabric storage ‘boxes’ for yarn or fleece. These were made for fiber storage (really, they were!) – the fabric is breathable, but tightly enough woven so little wool-eating beasties can’t get in. They zip on three sides, so the top flips all the way open for easy stuffing or rummaging. Instructions for the Romance shawlette said to use a crochet hook small enough to go through the hole of the bead to slide it on a loop of the yarn before working the stitch. 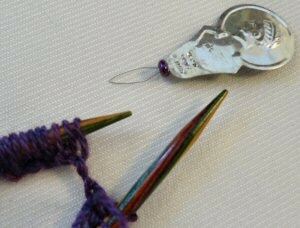 I have a number of teeny crochet hooks, but none were quite small enough for the hole in the beads I wanted to use. Bigger beads would not have been appropriate for that project, so I cast about for another way to do the job. 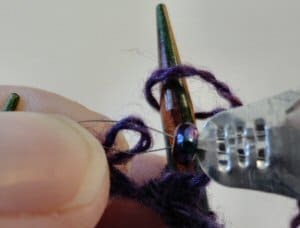 I knew I had a needle threader around the house somewhere, but I could lay my hands on some coated beading wire immediately! With the needle threader design in mind, I cut about 3″ of wire, bent it in half and creased it, then bent it again on each side about 1/2″ from the center. This gave me the same configuration as the threader; my quick version is not quite as easy to hold, but works like a charm. 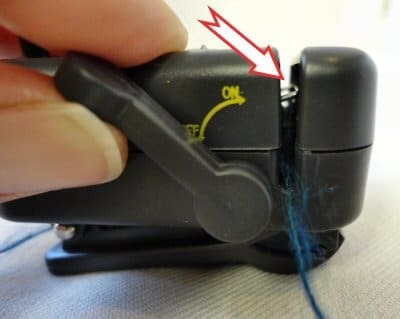 I just put a bead on my wire gizmo, slipped the loop of yarn off the left needle and caught the tip of the loop in the threader. 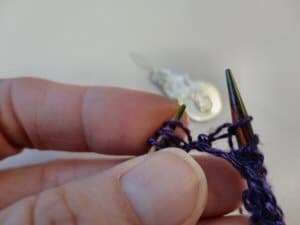 It was easy to slide the bead onto the yarn loop, then remove the threader and slip the loop back on the left needle to knit. 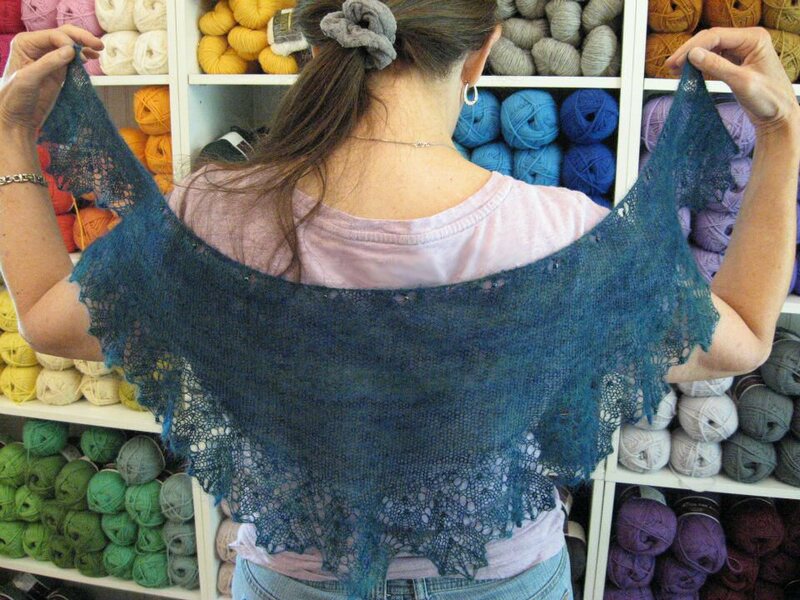 When I finished the shawl, of course, I found a needle threader, so I recreated the process with a different yarn to get pictures. Now, how about you? Do you have any ideas to share?